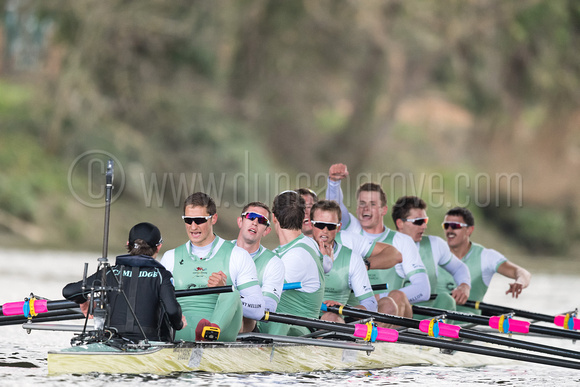 Duncan Grove FRPS Photography Blog » Oxford vs Cambridge Universities Boat Race 2016 images now online! The start of the 2016 OUWBC vs CUWBC (women’s) Boat Race. The victorious CUBC Blue crew. “Storm Katie” made shooting conditions very difficult but fortunately it abated slightly for the races. As it is not possible to follow both the women’s and men’s races (and given that last year I elected to follow the women’s race since it was an historic first), I decided that this year I would follow the men’s race. I was however able to blag my way onto a Boat House veranda in order to capture the start of the women’s race! Just two days previously, Nikon had delivered to me at the Media Centre the first two production Nikon D5 bodies into the UK. Their enhanced low-light capabilities, allied with the super-long £18,000 Nikkor 800mm lens helped me capture shots in these difficult conditions. Nikon subsequently published an article about this. See all 2016 Universities Boat Race image here.